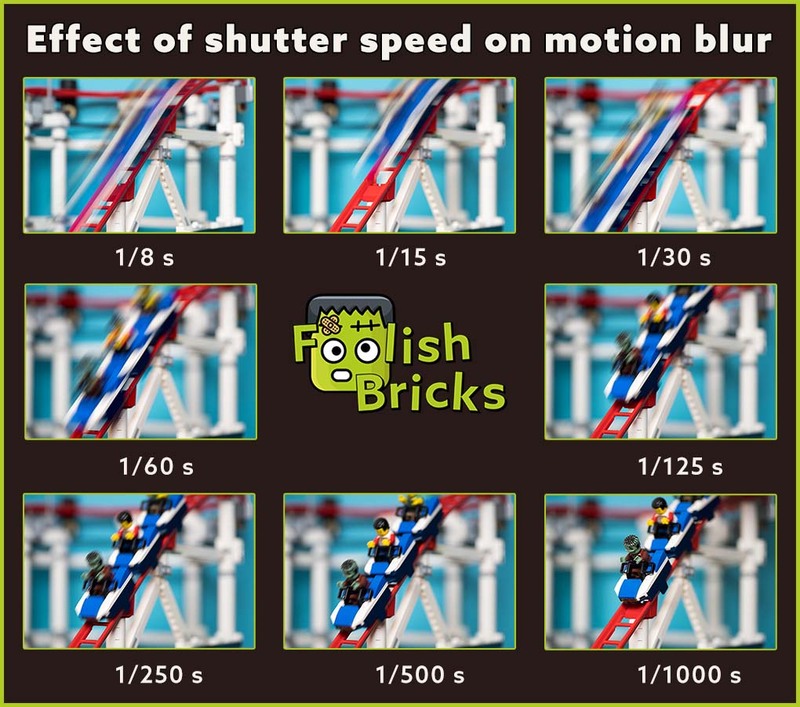 After writing extensively about exposure and the aperture in (Lego) photography, todays post will be on shutter-speed. Again, everything you need to know to switch the camera from automatic to manual for your (Lego) photography will be in this post. Anyway, let us dive right in. The shutter is a part of your camera that is in front of the sensor. As you know the camera-sensor is responsible for actually ‘recording’ the light from a scene you’re photographing, ultimately forming your photo. In front of this sensor, there is a blinder, named the shutter. The shutter covers up the sensor until a photo is being recorded. When you press the shutter-release-button (or simply ‘shutter-button’) the shutter uncovers the sensor for an amount of time equal to the shutter-speed and records the light from the scene you’re photographing and then covers the sensor up again. Shutterspeed, also called exposure time, is the amount of time your camera-sensor is exposed to light. In other words, it is the amount of time the shutter of your camera is open enabling light to reach your camera-sensor. This time is measured is seconds or fragments of seconds. The larger the denominator; the faster the shutter-speed with less light reaching the camera sensor. For example 1/60 is faster than 1/30. Different cameras have different ranges of shutter speeds, usually between 1/4000 sec (fast – sensor exposed for short time) and 30 sec (slow – sensor exposed for along time). Usually shutter speeds will (approximately) double between each setting. For example: 1/1000, 1/500, 1/250, 1/125, 1/60, 1/30, 1/15, 1/8 etc. Shutter-speed influences two aspects of the photo you are making; exposure and motion-blur. As I wrote before, shutter speeds in your camera will (approximately) double between each setting. This is good to remember, since doubling the amount of time the shutter speed is open will also double the amount of light that reaches the sensor, increasing the exposure (EV) by one stop. Conversely, halving the the amount of time the shutter speed is open will halve the amount of light that reaches the sensor, decreasing the exposure (EV) by one stop. These stops are the same as the ones when adjusting aperture. This means that when you increase or decrease the shutter-speed by a number of stops, you can adjust the aperture in the opposite direction by the same amount of stops. The exposure should remain the same, however motion-blur might and depth-of-field (DOF) will change between settings. 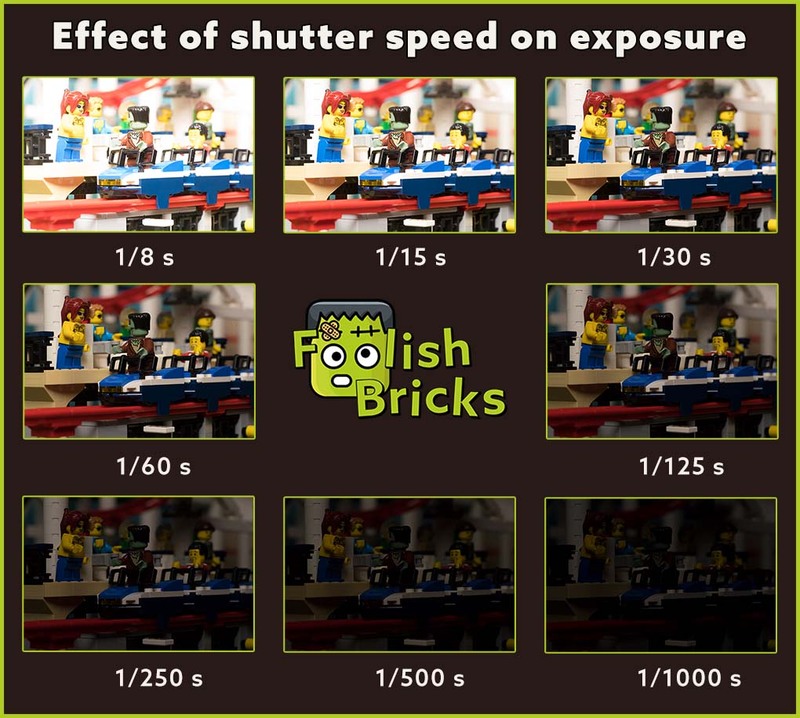 Figure 1 gives you examples of how the exposure changes resulting from changing the shutter-speed. An example; lets say your make a photo at 1/30, f/5.6. You decide you want a deeper DOF so you adjust your aperture to f/11 (2 stops). For the exposure to stay the same you can adjust your shutter-speed to 1/8, however, increasing the possibility of motion-blur. If you have trouble remember how to calculate these values at first you can use the exposure-triangle to help you. Lastly, besides changing shutter-speed or aperture, you can also change the ISO, as I will discuss next week. The other effect of changing shutter-speed is that you might introduce motion-blur. Motion-blur can occur if there are moving objects within the scene you are photographing. Moving objects can be at one location when the shutter opens and your start recording light, and at another location when you close the shutter again, stopping the recording. The more distance between those two locations; the more motion-blur occurs in your final image. Effectively, If there is movement in the scene you want to photograph, shutter-speed gives you the choice of either freezing the movement (so it looks still) or giving the object a motion blur (and so a sense of movement). Figure 2 shows you examples of motion blur at different shutter-speed settings. I adjusted the aperture and ISO to keep exposure equal. A second kind of motion blur can occur, even when the scene your photographing is static, because of (unintentional) camera-movement. Mostly, this is an unwanted effect when shooting in low light and or hit aperture-values, underexposing your image so you need slow shutter-speeds. As a rule of thumb, if you want t o take a photo with a shutter-speed of 1/60 or slower, it is probably best to use a tripod. Also keep the rule 1/focal length rule in mind (explained below). To be honest, I usually have no problem with motion-blur at whatever shutter-speed I use. The Lego scenes I usually photograph are static (and you need moving elements to get motion-blur), and I almost exclusively use a tripod, eliminating both motion-blur and camera-movement. I usually decide on the depth-of field I’d like, and then change the shutter-speed to whatever setting is necessary, even if it is several seconds. Lastly, there sometimes are two other sources of camera-movement which can give some unintentional camera-movement. Especially when shooting macro-photos of Lego I have this problem. First, when I press the shutter-release-button it can move the camera a little. This means I usually use a remote-control besides the tri-pod. Second, SLR-cameras can move a little when the mirror goes up. So, when its crucial to have a perfectly still photo, I lock the mirror before shooting the photo. Picking your shutter-speed is -again- an artistic decision. So, when considering what shutter-speed to use you should always ask yourself whether anything in your (Lego) scene is moving and how you’d like to capture that movement (water, cars, birds, etc…). Motion-blur is not always unwanted. In fact, it can really improve some photos if you purposely introduce motion-blur in your photo. As I’ve written earlier yo can choose to freeze a moving object, making it look perfectly still, however you can also intentionally introduce motion-blur giving the object a sense of movement. The more motion-blur there is, the faster the photographed object is perceived to be moving. Two examples are below. 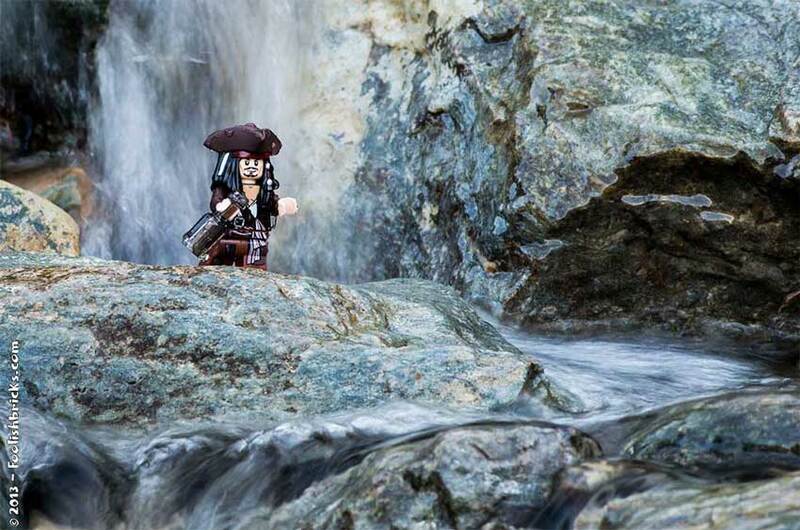 Figure 3 shows motion blur in the moving water coming down the waterfall and stream showing you how fast he water is moving. Figure 3; Slow shutter speed, showing the motion and beauty of flowing water and the waterfall. For the photo in figure 4, I used a slower shutter-speed and followed the motorcyclist with the camera, giving it a sense of speed because of the motion-blur of the background. 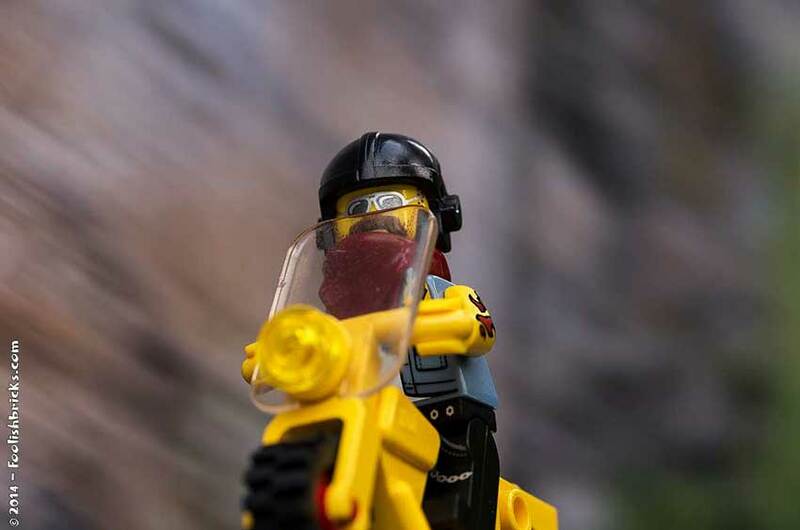 Should the background have been completely in focus, it would have looked as if the motorcycle stood completely still. I don’t consider this a good photo btw, mainly because I have trouble keeping a moving object in focus, that is the reason I only sporadically create pictures like these. When you are holding you camera, you will notice your hands will always tremble a little, giving rise to camera-movements. Mostly, you can get rid of these movements by using a faster shutter-speed. Or you can get rid of them by using a tripod. However, the amount of camera-movement is magnified by the amount of zoom (focal length) of the lens your using. The more zoomed in you are (longer focal length), the higher the amount of camera-movement and the faster the shutter-speed needs to be to counteract this movement. For example, if you are shooting a photo with a focal length of 60 mm, you’ll need a shutter-speed of no slower than 1/125. This is simply a rule of thumb. However, you might get away with faster shutter speeds at a given focal length because of new stabilised lenses, camera-bodies (Pentax) and sensors. In a camera the fractions of shutter-speed are usually displayed as the denominator only; so, 1/100 sec. as 100, 1/8 sec. as 8, ect. Shutter-speeds over a second are followed by an apostrophe; so, 2 sec. as 2’ and 30 sec. as 30’. If you want to select your shutter-speed manually for a photo there are two modes you can use: Shutter-priority mode (S or Tv (=time value)) and manual mode (M). In shutter-priority mode, you select the shutter-speed, and the camera automatically selects your aperture. In manual mode, you select both the shutter-speed and aperture manually. Some cameras also have a bulb-mode (B). this mode lets you keep the shutter open for as long as you hold the shutter-release-button down. The shutter-speeds on your camera are relatively straight-forward. Simply decide how you want to capture movement and how you want to deal with unwanted motion-blur and camera-movement considering the available light/ exposure. Then, set the shutter-speed accordingly. Use you knowledge of the exposure-triangle to adjust aperture and ISO accordingly. Again; there is nothing better to learn, that to practice and try, practice makes perfect. As always, I’m looking forward to the results.